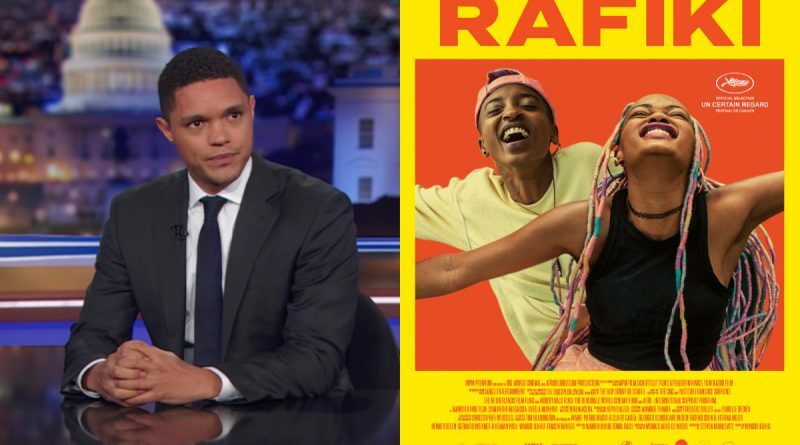 Popular witty, Daily Show presenter, Trevor Noah recently made fun at Kenya for temporarily lifting the ban on the debated ‘Rafiki’ movie so it can qualify for the Oscars Award nomination. The Kenya Film Classification Board (KFCB) had initially imposed a ban on the lesbian movie because it was against the African morals. However, Justice Wilfrida Okwany recently lifted the ban for a week so that the controversial movie can be screened in Kenyan cinemas with the aim of it being eligible for the Oscars nomination. The funny presenter went on making fun about how the Kenyan government was very much against the controversial movie to the extent of banning it, but they only support it because of the Oscars Awards nomination. “Homosexuality is an abomination to God’s word. What’s that? The Oscars? Play that film. I want to meet Meryl Streep!” Trevor added. Here is Trevor Noah’s statement uploaded on Rafiki Movie’s Twitter account. The movie had raised a lot of concerns in the previous weeks in the country. The KFCB CEO, Dr. Ezekiel Mutua had brushed off the reports that the movie is popular in the nation. During an interview with Citizen TV with host Anne Kiguta, the KFCB boss pointed out that his team is protecting most of the Kenyans since only a few of them had watched the movie. “We are protecting over 44 million Kenyans. Its only 300 people who may have watched it,” said Dr. Mutua. The KFCB CEO also stated that he was maintaining the moral code of the country. “Every country has its’ culture. Go to US, Dubai or UK. You can’t insult the Queen in the name of freedom. Dubai is developed, but they have a strict moral code. It’s not about me. It’s the law,” he added. Nonetheless, the Rafiki Movie had mixed opinions because some prominent figures seemed to support the film. For instance, former Chief Justice, Dr. Willy Mutunga, said that the KFCB boss needs to know that Kenya isn’t a homogenous society. Dr. Mutunga went on to advise the film director, Wanuri, to present their case in court if they wanted the ban to be lifted. Dr. Willy Mutunga’s tweet replying to Wanuri’s tweet about the ban on the film. The KFCB boss was asked if he would celebrate director Wanuri if she could ever win an Oscar award or any other related award, but the CEO said the director wasn’t nominated yet, and that he would rather celebrate the likes of Lupita Nyong’o. Even after the Justice Wilfrida lifted the ban temporarily for seven days, the Rafiki film still didn’t ‘meet’ Oscar Award’s requirements. The Rafiki Film was to be included in the Best Foreign Language Film category in the Oscar Nomination list. It is not clear if the ban will be imposed for good or the director and related producers of the movie will plead for the ban to be lifted for good.